You will gain strength and stamina as well as flexibility and weight control so you will feel great with your body. You will master form and structure, as well as hand/eye coordination which will aid in improving the muscular physique, speed, balance, timing and power. You will also notice an increase in your energy levels, and improve focus and concentration. We live in a very unpredictable world and you never know when someone may attack or harm you. It is a crucial time for people to learn how to defend themselves. (“you shall guard your lives”). It is of utmost importance that we learn how to do so. Learning self defense will provide you with the tools necessary to protect yourself and your loved ones if need be. Karate classes for kids will teach your children to protect themselves from bullies and deal with other confrontations. It will also help them grow into strong and confident adults. Karate promotes a positive attitude towards life through motivation and self discipline. As you advance in your Karate training you will become more self confident and gain a higher self esteem. The self control mastered in Karate improves discipline and overall determination, by providing you with a "can-do" attitude, and a respect for yourself and those around you. Karate teaches focus and awareness. You will benefit from improved concentration, a reduction in stress, and a feeling of peace, harmony, balance and clarity. The children's classes are for boys and girls ages 5- 11 years old. Sifu Mordechai provides individual attention and helps every student grow in their own capacity. Martial Arts helps the child to improve their confidence, self esteem, awareness, academic performance focus and concentration. It also aids in the physical and mental development of the child. Your child will learn discipline, self defense, relaxation and breathing exercises. Our goal is to to teach traditional Martial Arts in a frum environment (taking all avodah zara aspects out of the practice). As an instructor, Sifu Mordechai trains his students to use Martial Arts for self-defense and not Chas Ve’sholom to use the techniques they learn to become “bullies” or look for fights. He constantly reminds his students that the smartest and safest thing to do is to “walk away” from any situation if possible. The classes are both fun and challenging - with a mix of exercise, karate and related fun activities. General exercises include stretching, strengthening and balance exercises. In teaching the martial arts, we incorporate techniques such as blocks, punches, strikes and kicks. Much emphasis on the development of stances, mindfulness, and strength training goes into the classes. Fun competitions, drills and awards add to the enjoyment of the students. The adult classes for men and women are focused on Martial Arts for all levels, beginners to advanced, ages 12 and up. Through the classes you will develop strength, flexibility, technique, coordination, focus, discipline and a positive outlook in life. Sifu Mordechai also incorporates various relaxation techniques and stress reduction exercises into the adult classes. The classes will leave you with a great workout and an even greater sense of accomplishment. What is the Tora Dojo System? Tora Dojo was founded in 1967 by Grandmaster Harvey Sober, a professor at the Yeshiva University of New York. Tora is translated as “tiger” in Japanese and “Torah” in Hebrew, and Dojo means “school” in Japanese. 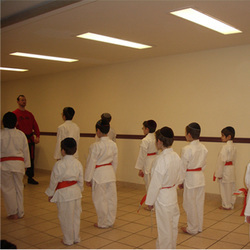 The goal of our system is to help a person build a connection with Hashem, develop character, respect, discipline, self-esteem and learn how to defend oneself. As a disciple of Grandmaster Sober, sifu Mordechai firmly believes in the importance of every frum Yid knowing how to defend themselves.